The festival of Purim, which fell on March 1 2018, celebrates Jewish survival in the face of intolerance, and the freedom to be Jewish. 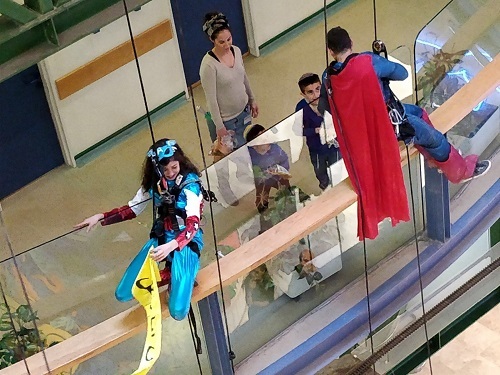 The photo above shows Superheroes delivering Mishloach Manot to excited children in the Mother and Child Pavilion at Hadassah Ein Kerem. Purim is considered a fun festival, full of liveliness and party celebrations, unequalled on the Jewish calendar. Purim has a spirit of giving and sharing, with two of the main customs being donating to charity and gifts of food (known as Mishloach Manot). This year Hadassah Australia continued its project of helping sick children smile at the Hadassah Hospitals in Jerusalem, by sending in Hadassah’s renowned Medical Clowns with Mishloach Manot.